The DM 118 Sub features an ultra-reliable power section that provides a total of 800 watts of peak available power with DDT compression. 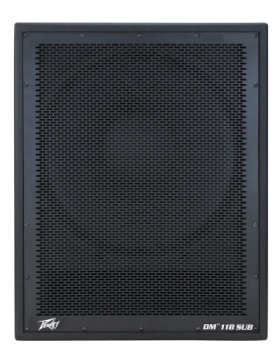 This powered enclosure also features an 18" heavy-duty woofer with a 3" voice spindle. The DM 118 Sub provides a balanced input via a combination jack that accepts balanced TRS 1/4" input as well as a balanced XLR input. There are two balanced thru high pass XLR outputs, and a full-range XLR output. There is an adjustable Level control, as well as a combination LED indicator, that illuminates when power is on and when the "soft-limiting" DDT circuit is activated.